Friday’s wide spread down candle on the euro vs dollar forex chart reinforced the weakness which was clearly evident from the previous four days which had signalled a variety of failed attempts by the eurodollar to move higher with all four candles closing with upper wicks of varying lengths. All of these candles failed to penetrate the USD1.46 price point and in addition also failed to breach the 40 day moving average which is now adding further downwards pressure. 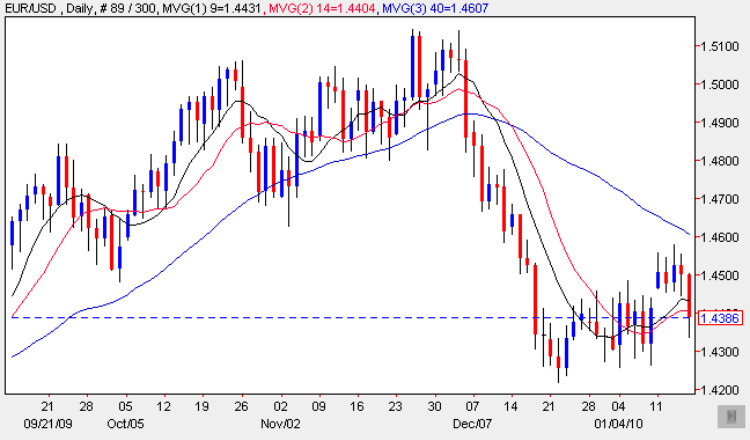 Friday’s candle finally succumbed closing the week below all three moving averages once again and in addition breaking below technical support in the USD1.44 price region. With the US markets closed today for a national holiday the euro vs dollar is likely trade in a narrow technical range as we await more significant fundamental news further in the week. I have covered this week’s fundamental news for the euro dollar in the main euro to dollar site. From a technical perspective, for the medium term, the key price level remains that at USD1.4250 and should this be breached then we can expect to see a sharp sell off in the eurodollar with a possible re-test of the USD1.38 price handle in due course. With all three moving averages now turning to the downside this analysis appears more likely. This bearish technical picture for the eurodollar is reinforced by the dollar index which despite December’s dollar rally still looks feeble.